Comment: 100% of this purchase will support literacy programs through a nonprofit organization! 5.0 out of 5 stars"Al, You hit a home run with this one my friend!" What an amazing book. Al, you hit a home run with this one my friend!" I wish I would have read it about a month earlier but I was saving it for one of my beach reads. I had a high school friend commit suicide a few weeks back now and WOW, you had some things in your book that I would have loved to have shared with him and his family. I am going to share your book with his mother because I know that she will get some peace from some of the words you have written. It also touched me in my peronsal life. Some of the feelings I had in my "growing up years", were right there, in black and white in front of me in your book. I truly believe that people are brought together for a reason and my friend, I believe you came up on my google screen the day I was searching for a speaker for our User Group conference for more than one reason. I just want to personally say THANK YOU for coming into my life! 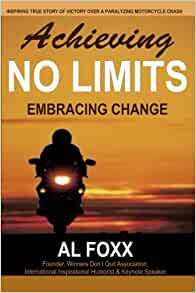 I very much liked 'Achieving No Limits: Embracing Change' because it was meaningful and inspirational. He went through a lot, grew strong and achieved a lot, but it is not a typical self-help book. It doesn't tell you how to get rich and become materialistic, what I find very annoying at times about other books. It is meaningful and a step to step guidance to grow strong. How to be a good person and how to have a positive meaningful life. His tragedy is big and he was close to giving up, because the challenges were too overwhelming, but what he is today is the result of a strong mind set and a will. A vision that made him drive to success. I'm very thankful that he spends his time today teaching us from his life journey and accomplishments, that should be rewarded and acknowledged by the people. I wish him more success on his journey, with his achievements and with this book. He is someone to look up to and I'm glad that I've found Achieving No Limits: Embracing Change. 5.0 out of 5 starsWhat a Courageous Man! The story of Al Foxx's life and what he has had to endure is incredible. He went from a happy go lucky 18 year old to a 19 year old with a broken body in one moment. But his spirit was not damaged. Despite this terribly devastating accident, he has risen and surpassed all of the doctors predictions of his future life. Not only is he a great writer but his speeches are wonderfully humorous. He has a unique ability to turn his pain into humor. This book is a must read for anyone suffering from any kind of limitation in their life. Al is an amazing man. He took a devastating accident with all its aftereffects like his partial paralysis and the brain damage and shaped his life in such a way that he can live with these and share with others what he has learned. His life is an example of what ones attitude can do to ones life. His insights and humor makes this book a good read. It is well worth ones time.